Second only to Leonardo da Vinci’s Mona Lisa, Edvard Munch’s The Scream may be the most iconic human figure in the history of Western art. Its androgynous, skull-shaped head, elongated hands, wide eyes, flaring nostrils and ovoid mouth have been engrained in our collective cultural consciousness; the swirling blue landscape and especially the fiery orange and yellow sky have engendered numerous theories regarding the scene that is depicted. Like the Mona Lisa, The Scream has been the target of dramatic thefts and recoveries, and in 2012 a version created with pastel on cardboard sold to a private collector for nearly $120,000,000 making it the second highest price achieved at that time by a painting at auction. 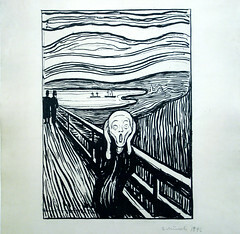 Conceived as part of Munch’s semi-autobiographical cycle “The Frieze of Life,” The Scream’s composition exists in four forms: the first painting, done in oil, tempera, and pastel on cardboard (1893, National Gallery of Art, Oslo), two pastel examples (1893, Munch Museum, Oslo and 1895, private collection), and a final tempera painting (1910, National Gallery of Art, Oslo). 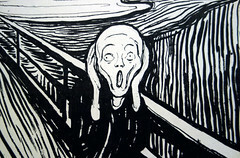 Munch also created a lithographic version in 1895. 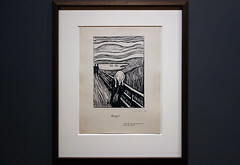 The various renditions show the artist’s creativity and his interest in experimenting with the possibilities to be obtained across an array of media, while the work’s subject matter fits with Munch’s interest at the time in themes of relationships, life, death, and dread. For all its notoriety, The Scream is in fact a surprisingly simple work, in which the artist utilized a minimum of forms to achieve maximum expressiveness. It consists of three main areas: the bridge, which extends at a steep angle from the middle distance at the left to fill the foreground; a landscape of shoreline, lake or fjord, and hills; and the sky, which is activated with curving lines in tones of orange, yellow, red, and blue-green. Foreground and background blend into one another, and the lyrical lines of the hills ripple through the sky as well. The human figures are starkly separated from this landscape by the bridge. Its strict linearity provides a contrast with the shapes of the landscape and the sky. The two faceless upright figures in the background belong to the geometric precision of the bridge, while the lines of the foreground figure’s body, hands, and head take up the same curving shapes that dominate the background landscape. The screaming figure is thus linked through these formal means to the natural realm, which was apparently Munch’s intention. A passage in Munch’s diary dated January 22, 1892, and written in Nice, contains the probable inspiration for this scene as the artist remembered it: “I was walking along the road with two friends—the sun went down—I felt a gust of melancholy—suddenly the sky turned a bloody red. I stopped, leaned against the railing, tired to death—as the flaming skies hung like blood and sword over the blue-black fjord and the city—My friends went on—I stood there trembling with anxiety—and I felt a vast infinite scream [tear] through nature.” The figure on the bridge—who may even be symbolic of Munch himself—feels the cry of nature, a sound that is sensed internally rather than heard with the ears. Yet, how can this sensation be conveyed in visual terms? Since The Scream’s first appearance, many critics and scholars have attempted to determine the exact scene depicted, as well as inspirations for the screaming figure. For example, it has been asserted that the unnaturally harsh colors of the sky may have been due to volcanic dust from the eruption of Krakatoa in Indonesia, which produced spectacular sunsets around the world for months afterwards. 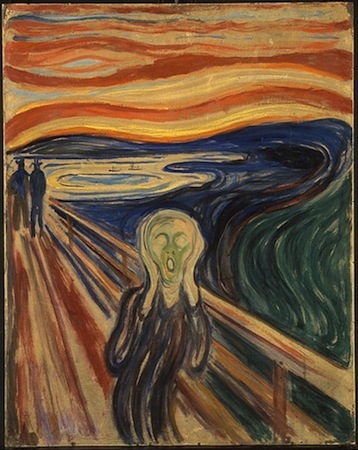 This event occurred in 1883, ten years before Munch painted the first version of The Scream. However, as Munch’s journal entry—written in the south of France but recalling an evening by Norway’s fjords also demonstrates—The Scream is a work of remembered sensation rather than perceived reality. Art historians have also noted the figure’s resemblance to a Peruvian mummy that had been exhibited at the World’s Fair in Paris in 1889 (an artifact that also inspired the Symbolist painter Paul Gauguin) or to another mummy displayed in Florence. While such events and objects are visually plausible, the work’s effect on the viewer does not depend on one’s familiarity with a precise list of historical, naturalistic, or formal sources. Rather, Munch sought to express internal emotions through external forms and thereby provide a visual image for a universal human experience. Cite this page as: Dr. Noelle Paulson, "Edvard Munch, The Scream," in Smarthistory, August 9, 2015, accessed April 19, 2019, https://smarthistory.org/munch-the-scream/.